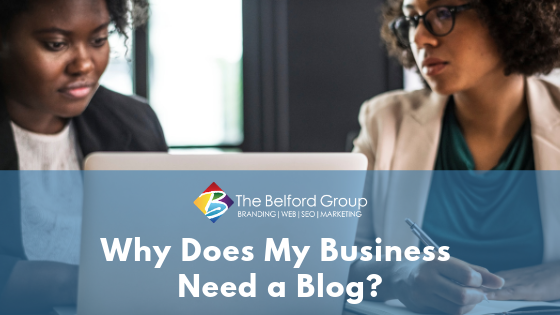 Your business needs a blog for many reasons. But here are 5 reasons why it’s time to start one or make the blog you currently have a priority. Blogs are a great way to gain new customers as well as maintain visibility with current clients. Businesses that blog receives 55% more website traffic than those that don’t. When a person does a Google search on topics relating to your business, you can earn potential new clients from someone who might never have heard of you otherwise. A blog can help you establish trust with your customers. Use it as an extension of your customer service efforts by addressing common concerns or answer questions. When you blog about what’s important to them, you are communicating that you want to use your expertise to provide them with solutions. That makes your readers trust you, and people are more likely to buy from a company they trust. Chances are, you aren’t the only business of your kind on the web. While no two companies are identical, they may provide some of the same products or services that you do. So, it’s important to emphasize what makes your company unique. Blogging helps to show your personality, information, and experience that will distinguish you from your competitors. If you want your target audience to notice you, your business needs a blog. A blog benefits your business by creating more opportunities for you to present offers and generate leads. Business-to-business (B2B) companies that consistently publish blogs receive 67% more leads than those who don’t. Are you still wondering why your business needs a blog? Here’s one last, and maybe the most important, for Search Engine Optimization. Consistent blog posts help you to increase your search engine rankings. Search Engine Optimization (SEO) is the long game. You won’t get to the first page of Google overnight, but it’ll significantly enhance your rankings over time. How? Because search engines will reward you for producing fresh content, using relevant keywords, and meeting the needs of online searchers. Growth doesn’t happen in a vacuum. It occurs in correlation to your competitors, target audience, and search engines. One of the most compelling and cost-effective avenues to reach your audience is consistent blogging.